Dr Otto Spethmann is a widowed psychoanalyst working in St Petersburg in 1914, a city bracing itself for an impending war with Germany, whilst also in turmoil as reactionary forces seek to foment a revolution. Amongst his patients are Anna Petrovna, a rich heiress who is troubled by a past event, and Avrom Rozental, a chess master on the verge of a nervous breakdown who is about to take part in a tournament, whom his famous musician friend and chess rival, Kopelzon, has asked him to treat. As a chess player, Spethmann is keen to help Rozental overcome his demons, but he’s distracted by his attraction to Anna and a murder that the police have linked to him and his daughter, Catherine. Despite his efforts to distance himself from the case, including seeking the intervention of influential citizens such as Anna’s father, Spethmann finds himself the target of a persistent police officer who suspects him of being implicated in a revolutionary plot to kill the Tsar. Whichever way he turns he appears to be in Zugzwang: a position in chess in which a player is obliged to move, but every move available will only make his position worse. Zugzwang moves along at quick clip, the story laced with intrigue and twists. The historical context of St Petersburg in 1914, and its various conspiracies and revolutionary plots, forms a nice backdrop to the story without dominating the narrative. The characterisation is well realised, if a little clichéd at times, and whilst the writing is engaging and plot intricate, the tale felt a little over-contrived, with various, complex inter-relations between several characters and interweaving subplots. 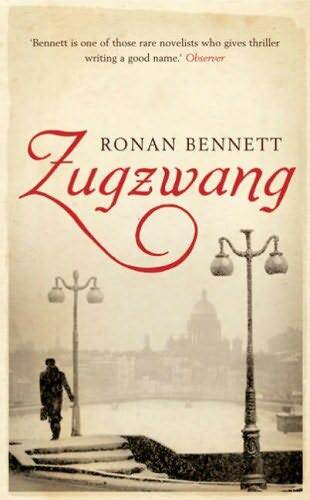 This is partly a result of Bennett seemingly trying to position every major character in a position of Zugzwang. One nice touch is the inclusion of a chess game (including a picture of the board, the positions of the pieces and the moves) between Spethmann and his friend, Kopelzon, that mirrors Spethmann’s movement through the plot. Overall, an enjoyable, if melodramatic, page-turner with an interesting backdrop.